WILL YOU BE AGAIN OUR CAMPING GUEST?? 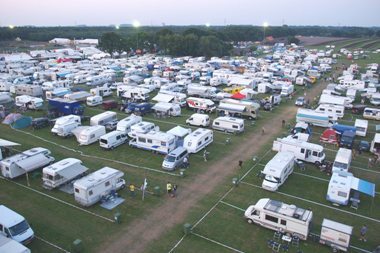 Last years thousands of motocross fans were our guests and they are this year again more than welcome on our camping site. They enjoyed the joviality of the other camping guests. Again MAC Lierop will create a beautiful camping area for the Grand Prix of The Netherlands, on the 29th and the 30th of August. You will get the feeling that your are on a three star quality camping: all facilities are there. The camping place is nearby the circuit, but you don't have to worry about a lot of noise or your privacy. On the track Camping there also fresh rolls available at the bakery. Camping people are friendly, they enjoy their beer and like to make contacts with other fans. Your partner wants to enjoy the nature? No problem in Lierop! Nearby there is a lot of nature where you - maybe - enjoy the company of 'wild' animals. Especially in the early morning you have a big chance to meet a roe! MAC Lierop will do everything to please you. The only thing you have to take care of yourself is a good mood and a good atmosphere. But looking back in the past we think this will be no problem. One vehicle, camper, caravan or tent, € 35,-. The camping will be open from Thursday morning, September 5th, until Monday morning, September 9th. Entrance by means of Groenebeemdweg Lierop. The camp-site has been every day opened from 09h00 until 23h00u. 7th and 8th of September!